Thinking About Getting Durable Shutters? Possibly you’ve seen the devastation that crazy weather conditions can wreak upon homes in general. And whereas you may not be able to stop Mother Nature in her tracks, or necessarily all of the effects of tornadoes and similar disasters related to the weather, protecting your home with durable shutters can help provide some layer of defense against the odds. But choosing those shutters can be a bit more involved than just walking into a store and saying, “Umm… that one.” A smart, informed choice could mean the difference between the weather staying outside where it belongs or thrusting itself upon your home, your valuables, and your family. 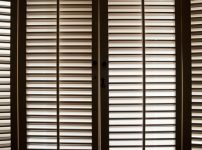 So what do you want to look for in a superior set of shutters? The color of your shutters matters. Otherwise, people wouldn’t agonize over shades, hues, tones, etc. the way that they do. And because you picked out that color with the utmost care and forethought you want it to stay exactly the way it was when you first laid eyes on it. Not faded by the sun and rain. No. Those shutters should look as beautiful as the day you purchased them. The color should have long lasting protection through a multi-coating process or some comparable method of applying and fixing the color (which you may have gone so far as to custom match). 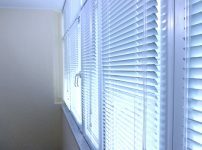 UV resistance is another method of protection that should be offered by reputable companies dealing in window treatments. There are any number of materials with which you can go when it comes to the shutters in your home including wood hybrids, faux wood, and real wood. How those materials are put together is of the utmost importance. Poorly constructed shutters might look good for a while but eventually, that poor construction will be put to the test and fail miserably. The glue used, the joints, the core, installation, manufacturing, measurements, etc… all of these play a part in assuring the best quality and most dependable durability possible. As just mentioned, the material you choose for your shutters plays a big part in their usefulness, durability, strength, appearance, etc. so choose wisely. A hardwood doesn’t have to be heavy to be straight and sturdy. When it comes to faux wood shutters, a compound that has been designed to stand up to the toughest conditions is what you want your shutters made from. Shutters that are resistant to termites, fire, and moisture are superior window treatments and exactly what is needed to protect your family and your home. And, of course, whenever possible, shop for the best deal that includes a good warranty. What does a good warranty entail? Your choice of window treatment should, regardless of heat and other conditions, never peel, chip, fade, crack, or warp. That sounds like a lot but, seriously, would you have it any other way when it comes to you and what you hold most dear?